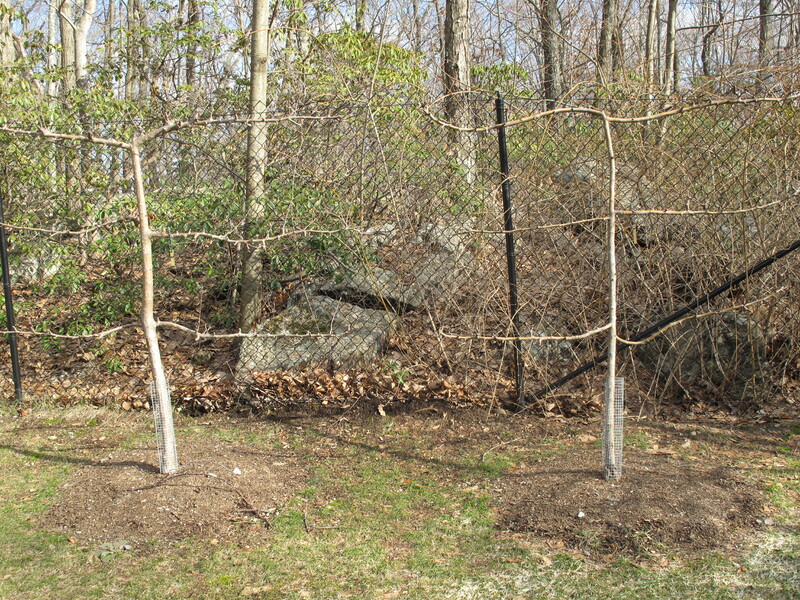 This is my set of espalier apple trees. They may be a little hard to see without leaves or fruit on them, but there are two of them. Each tree has six horizontal branches on them–two at the top, two in the middle and two towards the bottom of the tree. They are waiting for Spring to take full charge of the weather and then they will bud and sprout leaves. I also hope to get a few apples from them this year. The trees were purchased last year towards the middle of Summer at a local nursery that specializes in trees of all kinds. While the tree nursery is not open to the public, my friend is a landscaper and was able to buy them on my behalf. Each tree is approximately six feet tall and about five feet wide. 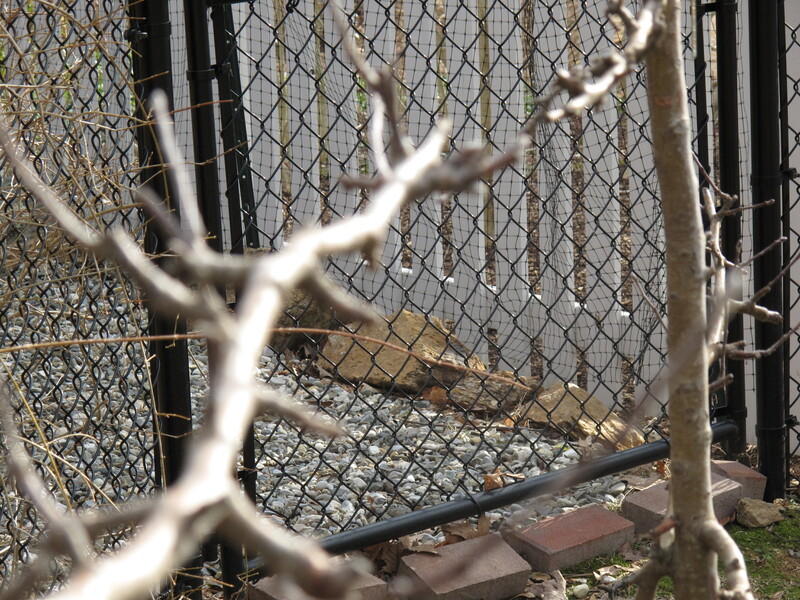 The first year, due to the trauma of their transplant, the trees were full of leaves but did not produce any fruit. The nursery had told us that this was normal and that fruit should come on strong in the coming year for the trees. When I bought them, the nursery said they were seven years old. We are now going into their eighth year. I wanted to show the bare trees now so that as they grow and prosper (meaning provide me with some apples) that we started at their 2011 beginning. A little history on espalier trees. Espalier is a method of training and pruning a tree or shrub, forcing it to grow flat against a wall or a free-standing trellis. The word espalier is French, and it comes from the Italian spalliera, meaning “something to rest the shoulder (spalla) against”. During the 17th Century, the word initially referred only to the actual trellis or frame on which such a plant was trained to grow, but over time it has come to be used to describe both the practice and the plants themselves. The practice was popularly used in the Middle Ages in Europe to produce fruit inside the walls of a typical castle courtyard without interfering with the open space and to decorate solid walls by planting flattened trees near them. While they are very pretty in a garden, espalier trees are also an effective technique for producing an ample crop of fruit in a small space. My espalier trees are two different varieties. 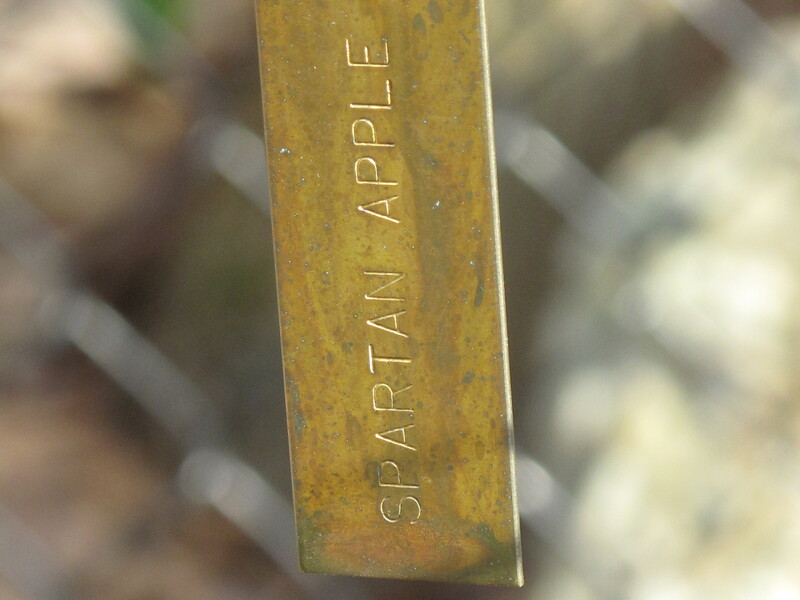 The first is a “Spartan” apple tree. The Spartan apple is a cultivar developed by Dr. R. C. Palmer and introduced in 1936 from the Federal Agriculture Research Station in Summerland, British Columbia. The Spartan is notable for being the first new breed of apple produced from a formal scientific breeding program. The apple was supposed to be a cross between two North American varieties, the McIntosh and the Newtown Pippin, but recently it was discovered through genetic analysis that it didn’t have the Newtown Pippin as one of the parents and its identity remains a mystery. The Spartan apple is considered a good all-purpose apple. 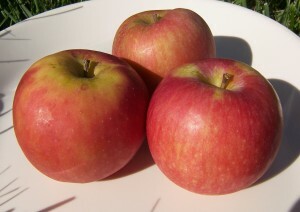 The apple is of medium size and has a bright red blush, but can have background patches of greens and yellows. 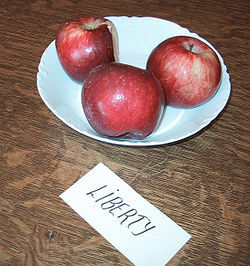 The second type of apple tree that is in the garden is a “Liberty” apple tree. 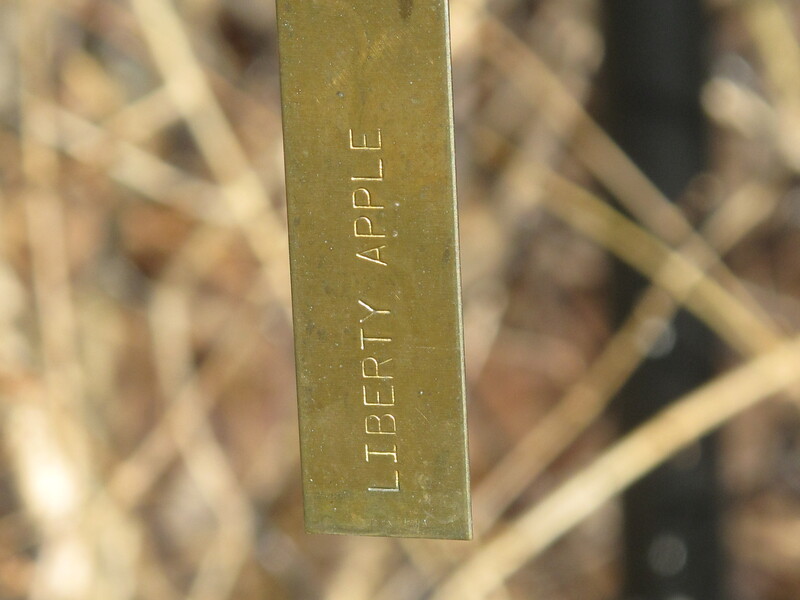 The Liberty apple is a hybrid cultivar developed by the New York State Agricultural Experiment Station. It was first pollinated in 1955 by crossing a Macoun with a ‘Perdue 54-12’ for the sake of acquiring disease resistances. It was first released to the public in 1974. The skin is red and smooth with a juicy flesh. So I hope you enjoyed meeting Mr. and Mrs. Espalier. I will share their journey throughout this year. Our goal will be a picture here on Acorns On Glen of an apple pie that contains the fruit from these two trees at the end of the season. Keep your fingers crossed. Next for our espalier couple is having my landscaper friend come and build a support system (a trellis or frame of sorts) for them to keep their branches straight and help provide support when the branches become heavier with their leaves and fruit. There’s a lot more to come with our trees. Do you have a favorite apple recipe that you would like to share here on Acorns On Glen? This entry was posted in The Garden-2011 and tagged Food, Life, Nature. Bookmark the permalink. I hope you get all the apples you will need for the summer. I have a feeling you will. You are like a man I know (and you do to) who has a green thumb. You treat your plants and trees with respect, give them the proper care and just seem to have that ability to grow things. Good luck and have fun with your garden and trees this summer. Hi Carolkin. I think the espaliers are one of the best things in my garden. So pretty and so practical. I’m hoping they will make a lot of stories on my blog as they progress. Do you think they are both males or are they a Mr. and Mrs. set? I think they are married. Come back and visit soon.